Course Distances as well as a description of each course can be found below. Clicking the map will open up a printable PDF for your convenience. BIKE: Starting outside the pool on Monash Avenue, bike riders will proceed north and turn left into McCallum Street, then at the roundabout they turn right into Curlewis Street and head north. At King Street they will turn right. They will ride the length of King Street, then turn right into Arnoldt Street before turning left into River Road. They will ride the length of River Road, until they come to a T intersection. Here they will turn right onto Murraydale Road and continue until they reach Woodgate Road and turn right again. They will ride the length of Woodgate Road, do a U turn and return to Murraydale Rd. They will then turn left onto Murraydale Road and ride to Runciman Road where they turn left and ride the length of Runiciman Road before doing another U turn. Riders will return to Murraydale Road, turn left and continue until they reach River Road and turn left again. Riders will then return to finish in Riverside Park along the same route as they came. 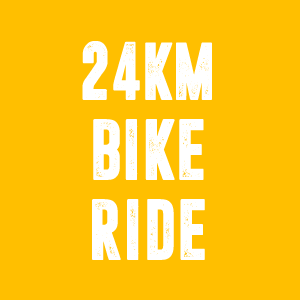 Distance 24km. SWIM: Starting at the Swan Hill Outdoor Pool, swim 50 metres. BIKE: Starting at the Transition Area on Monash Avenue, bike riders will ride south on Monash Avenue to The Gem, do a U-turn and return to the transition area. Distance 2km. RUN: Leaving the transition area, runners will run to the river, past the 10 steps, past the basketball court, turn right at the Riverside Park Cafe, run along the gravel footpath past the fountain and finish in front of the sound shell. Distance 800m. SWIM Starting at the Swan Hill Outdoor Pool, swim 500m. RUN: Leaving the transition area, runners will head north along the River Walk to the Wetlands in Federal Square, they will run around the Wetlands and then head back towards the park, run past the 10 Steps, enter the BIG 4 Caravan Park and run through the caravan park exiting out the gate at the southern end of the caravan park. They will then continue south along Monash Drive before entering the Pioneer Settlement through the Lower Murray Inn gates, running through the Settlement and out the southern end gate near The Gem. They then run back to Riverside Park via Monash Dr and finish in front of the sound shell. Distance 5km. SWIM: Starting at the Swan Hill Outdoor Pool, swim 200 metres. BIKE: Starting at the Transition Area on Monash Avenue, bike riders will proceed north and turn left into McCallum Street, then at the roundabout they turn right into Curlewis Street and head north. At King Street they will turn right. They will ride the length of King St, then turn right into Arnoldt St before turning left into River Road. Riders will next begin “the loop” by turning left into Douglas Rd and ride to the T intersection with Murraydale Rd. Here they will turn right into Murraydale Rd, then right into River Rd and ride the length of River Road before heading back to the transition area along the same route they came. Distance 12.5km. RUN Leaving the transition area, runners will run across Monash Drive to the river walk footpath and head south. They will run past the 10 Steps, enter the BIG 4 Caravan Park and run through the caravan park exiting out the gate at the southern end of the caravan park. They will then continue south along Monash Drive before entering the Pioneer Settlement through the Lower Murray Inn gates, running through the Settlement and out the southern end gate near The Gem. They then run back to Riverside Park via Monash Dr, past the Riverside Park Cafe, along the gravel track past the fountain and finish in front of the sound shell. Distance 2.5km. RUN/WALK Starting on the NSW side of the Swan Hill bridge runners will run along the dirt track past Pickering’s Transport, past the Murray Downs Homestead and continue on until they turn right onto Murray Downs Drive and head towards the Murray Downs Golf & Country Club. Once they reach the Murray Downs Golf & Country Club runners will do a U-Turn and head all the way back to the Swan Hill bridge. After crossing the bridge they will run underneath the bridge and head north towards the wetlands along the River Walk footpath. Runners/walkers will then go around the Wetlands and then head back towards Riverside Park, run/walk past the 10 steps, into the caravan park, through the caravan park and exit via the gate at the south end onto Monash Drive before entering into the Pioneer Settlement. They will then run/walk past the Lower Murray Inn, through the main street of the Pioneer Settlement and out the southern gate near the Gem. They will run/walk back to the Riverside Park via Monash Dr, past the Riverside Park Cafe, along the gravel track past the fountain and finish in front of the sound shell. Distance 15km. RUN/WALK Leaving from Riverside Park, runners/walkers will head north along the River Walk path to the Wetlands in Federal Square, they will go around the Wetlands and then head back towards the park, run/walk past the 10 steps, into the caravan park, through the caravan park and exit via the gate at the south end onto Monash Drive before entering into the Pioneer Settlement. They will they run/walk past the Lower Murray Inn, around the Settlement and out the southern gate near the Gem. They will run/walk back to the Riverside Park via Monash Dr, past the Riverside Park Cafe, along the gravel track past the fountain and finish in front of the sound shell. Distance 5km.